If one has a planet well placed but not giving results because it is weak then it must be strengthened. The Digchakra showed the power of the planets. The Digbalas of a planet are its most powerful placement in the sky and in the day. The first house is Sunrise and Brahma Gyatri, it is a very sattvic time where Jupiter and Mercury are strongest. The tenth house is the zenith of the sky, it is where the Sun is hottest. It is the Visnu Gyatri and Mars and Sun find there greatest strength at this time. The 7th house is sunset and the Siva Gyatri, Saturn finds his strength at this time as the day ends. As shastra says Rahu acts like Saturn, we infer that Rahu also finds his digbala in the 7th. The 4th house is the nadir; it is the midnight where Moon and Venus shine brightest. It is also the Kali Gyatri where the Mother gives moksa. For example, look at Brahma Muhurta (Sunrise). It is said that meditating at Sunrise will give the effects of Jupiter in the ascendant. What does Jupiter in the lagna mean really anyway? Depending on its disposition it makes a person optimistic with the opportunities for great rise in life, it gives wisdom, good nature, and spirituality. The scriptures say that Jupiter alone in the lagna will make a person trishuldara (holder of the trishul) which is Shiva, the person is a great guru like Shiva. 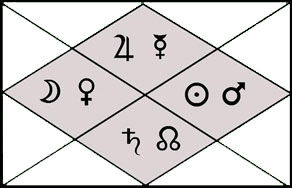 Jupiter alone in the lagna in its own sign or in cancer makes a person Chakradara (holder of the chakra) who is Visnu. A great sustainer of the world/sciences/Vidya. There is great success because the blessings of god are with a person in what they do and what they do has great benefit for the world. If we want to invoke expansion, unfoldment, creative growth, wisdom, spirituality which is ruled by Jupiter then sunrise is the most powerful time to do mantra, meditation or upaya for Jupiter. So by meditating at sunrise when Jupiter is at its strength it is like having Jupiter in the first house. The blessings of Jupiter in the first house fall on your head. By practicing at sunrise we invoke the grace of Guru, the blessings of Guru. We invoke the blessings of Shiva, the supreme Guru. Delusion is dispelled and clarity comes. Vedic astrology is called the eye of the Vedas, Veda means knowledge. To be a good astrologer we need to have the blessings of Guru, for it is He who gives the eye of knowledge. Practices at sunrise will give the results of having Jupiter in the first house, as practices at noon will be like having Mars or Sun in the 10th house. If we want to work on the Sun (career, confidence, etc. ), noon time is a powerful time to practice as it is the Suns strength. Mantra, meditation or upaya at noon time gives results like having the Sun in the tenth house; you gain the power of a king. The Sun and Mars get digbala in the artha trikona because they give the power to achieve artha. The digbalas are based on the planets ability to attain the ayana (goal) of the Kendra and its trikona. If we want to work on the Moon (mind, emotions, perception) midnight will be very effective. Shakti pujas are normally done in the night for this reason. The Moon and Venus give the power to achieve the goals of the moksa trikona. Saturn in the seventh is working in the kama trikona. The 7th house is the house of rebirth, the 7th house shows some of the reasons we have taken rebirth. When Saturn is placed in the 7th he fulfills the desire and ends it. A desire is not truly satisfied if it keeps returning, so Saturn is the means to achieving our desires and ending them.